At an early age, Wisconsin native Jonathan Horan learned a love of classical cuisine cooking alongside his grandmother, Lucille, a 1960 graduate of Le Cordon Bleu, London. After college, Jon worked several service jobs and in 2010 decided to follow in his grandmother’s footsteps and enrolled at Le Cordon Bleu, London. During his time in London, Jon learned Mediterranean cuisine under the tutelage of Chef Raphael Duntoye of La Petite Maison. He also did a stretch at Hugh Fearnley Whittingstall’s famed River Cottage HQ in Axminster, Devon, UK. In 2014, Jon returned home to Wisconsin and married his wife Kathryn. He had two goals: open a restaurant and start a family. 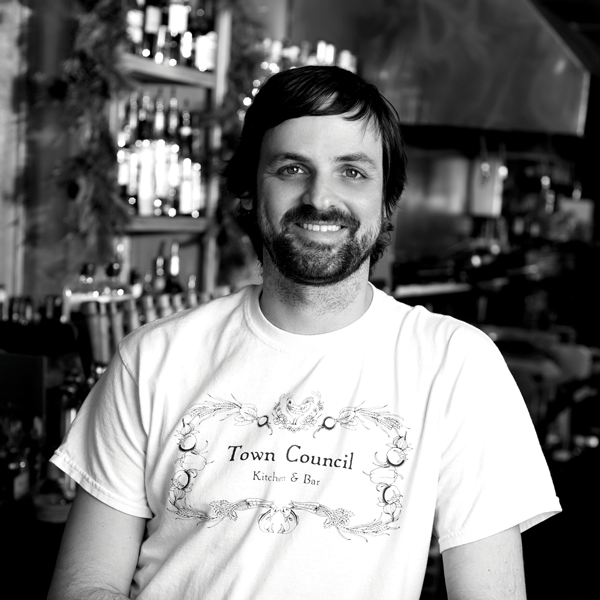 In 2016 he opened Town Council Kitchen and Bar with friend and front of house manager, Sean Hathaway-Casey. Town Council Kitchen and Bar is a new-American, open concept kitchen serving locally sourced, scratch cooking driven by classical French technique. A year later, they added a small, four season urban farm to their operation. When you eat a salad course at Town Council, it is likely that the greens were plucked from the farm that day by one of the wait staff that dually manage farm operations. In 2017 his second goal was fulfilled with the arrival of his daughter, Lois Lucille. His second child is due in May.